1. Introduction. 2. Mathematical background. Random variables. Random processes. Fourier analysis. 3. Models of chromatography. Plate models. Mass balance model. General rate model. Statistical model. Asymmetrical peak shapes. Nonlinear chromatography. Extra-column effects. Exponentially modified Gaussian model. 4. Data acquisition. Sampling theorem. Errors of digitalization. Recovery of the analog signal. Practical issues of sampling analytical signals. Quantitation. A/D converters. 5. Peak shape analysis. Empirical peak shape models. Curve fitting to the empirical models. Characterization of peak asymmetry. Comparison of peak shapes. 6. Noise. Noise types and sources. The observed noise. Noise in analytical signals. Noise profile of chromatographic detectors. Signal-to-noise ratio. Computer simulation of noise. 7. Signal enhancement. Digital filters. Filtering in time domain. Ensemble averaging. Correlation techniques. Fourier-domain filtering. Kalman filter. 8. Peak detection. Matched filters. Peak detection by derivatives. 9. Quantitative analysis. Graphical integration of stand-alone peaks. Graphical integration of overlapping peaks. Numerical measurement of peak height and peak area. Accuracy and precision of the measured values. 10 Resolution enhancement. Peak resolution. resolution of overlapping peaks. Peak sharpening. Moment analysis of overlapping peaks. Deconvolution using natural computation. 11. Multivariate signal resolution. Factor analysis. Spectral and chromatographic ratioing. 12. Transform techniques in chromatography. Fourier transform. Other transforms. 13. Information theory. Entropy and information. Entropy of random variables. Information transfer through channels. Information content of quantitative analysis. Maximum entropy method. 14. Quality assurance and validation. Errors associated with analytical measurements. Calibration. Limit of detection. Validation of new analytical methods. Validation of the chromatographic system. 15. Statistical theory of peak overlap. Peak resolution in multicomponent chromatograms. Determination limit. Combinatorial analysis of peak overlap. Random retention pattern. Superposition of retention patterns. Recognition of the retention pattern. Estimating the number of compound families. Multidimensional separations. Order-disorder in multicomponent mixtures. 16. Fourier analysis of multicomponent chromatograms. Power spectrum of multicomponent chromatograms. Power spectrum of a Poissonian chromatogram. Power spectrum for constant peak width. Power spectrum for varying peak width. Autocovariance function of multicomponent chromatograms. Parameter estimation. Determination of the retention pattern by Fourier analysis. Simplified Fourier analysis. Determination of the proper sample size by Fourier analysis. Index. 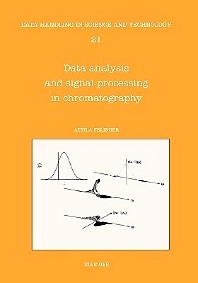 This book gives an overview of the numerical data analysis and signal treatment techniques that are used in chromatography and related separation techniques. Emphasis is given to the description of the symmetrical and asymmetrical chromatographic peak shape models. Both theoretical and empirical models are discussed. The fundamentals of data acquisition, types and effect of baseline noise, and methods of improving the signal-to-noise ratio (either in time or in frequency and wavelet domain) are thoroughly discussed. Resolution enhancement techniques, such as curve fitting, deconvolution by Fourier and wavelet transforms, iterative deconvolution, Kalman filtering and multivariate methods of curve resolution are all discussed with several chromatographic examples. Quantitative analysis by peak area of peak height measurement, the precision and accuracy of the quantitation of stand-alone or overlapping and symmetrical or asymmetrical peaks are treated. In a separate chapter, guidelines are given for the use of transform techniques for the analysis of chromatograms. • The first book with a thorough overview of the statistics of peak overlap.